I've heard the question posed at times: Would you change/take away your child's diagnosis if you could? People fit into two camps on this one, of course. Yes (take it away!) or no (I wouldn't want to change my child and the path we're on). Me? I'm in the resounding yes category. That doesn't mean I don't love and accept my child for exactly who he is, but if I could change things I definitely would. And it doesn't mean I don't understand why someone might answer the question with a no; I'm well aware that we would be different people without cerebral palsy in our lives. That's both a good thing (we have more compassion) and a bad thing (we struggle daily). A couple of mornings ago, Elijah woke up early (before six). Andy let Eli out of his room and we let the little guy run around upstairs for a bit as we tried to convince ourselves that it was indeed morning. About ten minutes had passed when Andy got out of bed and that's when Andy noticed something on Elijah's face. Oh, Eli must have gotten into some of Lisa's make-up, Andy thought and he wiped off Elijah's face. Except it wasn't make-up, it was a raw wound. Somehow Elijah had injured himself in that span of time and we had no idea how or where. But how? How? How? How? How? The question has been repeating over and over in my head for the past two days. I examined our room, trying to enact any possible scenario that could've caused his injury. We hadn't heard him fall, he hadn't made a peep or cried. The last two days I struggled with guilt (how is it that our child hurt himself and we didn't know it?!) and grief (our child is unable to tell us what happened). Every time I looked at Eli I was reminded...he's hurt and he can't tell us how by talking or pointing. His wound looked almost like a burn. What if we're missing something? I kept wondering. What if it happens again? And it did happen again. This morning Andy heard Elijah wake up and he went to let Elijah out of his room. "Lisa," Andy said, waking me. "Come here. Look what happened." Standing next to his dad in the hallway was Elijah, his face covered in blood, his eyes still squinting from sleeping. "What in the world?" I said and glanced towards Elijah's room. There was blood all over the carpet next to his door. 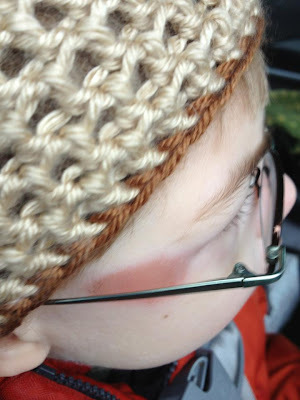 We had thought Elijah's wound looked like a carpet burn, but I couldn't have imagined that he had been harming himself like this. We think he got up in the middle of the night, made his way to the door to leave, but being tired laid down on floor next to the door and put himself back to sleep by rocking and rubbing his face on the carpet. He hadn't hurt himself in those ten minutes the other morning, but rather in the night. We couldn't have known, couldn't have protected him from this unknown danger. I'm glad we have an answer finally as to what caused Elijah's injury. It's not what I had expected, although, I can't say either of us are really surprised. Being able to appreciate pain is such a blessing; Eli had no idea that he was even hurting himself. So, would I change Elijah's diagnosis if I could? You betcha. I would sign up for healing today. Today, Lord?